but you do want to spice it up a bit… Latisse will help you grow your lashes longer, fuller and darker. Its a small tweak that will get you a big response. Everyone in our office loves the product and uses it regularly. 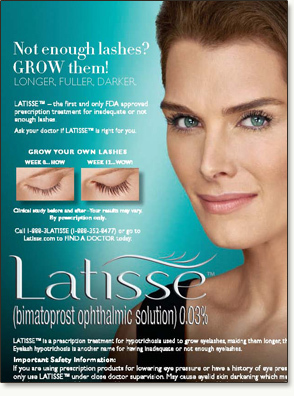 You can read about the product and any potential side effects here on Latisse's site. We offer Latisse at our office. Just call to set up a five minute visit and walk out with your own box of Latisse. Help make wishes come true Borrowing on the tradition of blowing on an eyelash to make a wish come true, the LATISSE® Wishes campaign aims to raise awareness and support for the Make-A-Wish Foundation®. Allergan has already committed $500,000 to the Make-A-Wish Foundation and, with your help, will increase this donation to $1 million. Actress Brooke Shields and beauty expert to the stars Anastasia Soare have joined Allergan to launch this campaign designed to make wishes come true. The Make-A-Wish Foundation grants the wishes of children with life-threatening medical conditions to enrich the human experience with hope, strength and joy. Founded in 1980 when a group of caring volunteers helped a young boy fulfill his dream of becoming a police officer, the Foundation is now the largest wish-granting charity in the world, with 66 chapters in the United States and its territories. With the help of generous donors and more than 26,000 volunteers, the Make-A-Wish Foundation grants a wish every 40 minutes and has granted more than 174,000 wishes in the United States since its inception. For more information about the Make-A-Wish Foundation, visit www.wish.org and discover how you can share the power of a wish®.